Witchfinder General: Days of Revelation is a veritable feast, intended to satisfy a wargamer’s hunger for excitement and to nourish the imagination. The game is based on a beastly blend of folklore, myth, 17th Century history and the essence of classic horror movies. Vile abominations pounce, rage and shape-shift; the witches are wicked and as tough as old boots so beware their Evil Eye and keep watch over your livestock; woe betide the foe of the angry villagers and never eat a pie offered by a stranger – no matter how tantalising it smells. You have been warned! 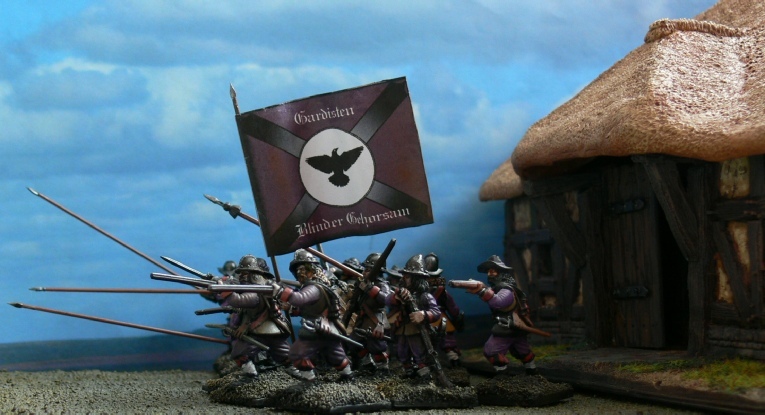 Witchfinder General: Days of Revelation is a skirmish wargame for two players, or sides, to do battle. You can have a great game with as few as ten 28mm figures per player. Alternatively the game will allow players to field larger forces, with up to 30 or so figures per player. It is not designed to simulate large-scale 17th Century battles involving large blocks of infantry etc. There are core rules concerned with manoeuvring the figures under your command, shooting at the enemy and close quarter fighting, or fisticuffs, as it is called in the game. Mounted figures slash & gallop, horses bolt and hungry troops forage for food in gloomy conditions. You can try to blow the gates of the enemy to smithereens with a petard or cannon fire, or if you prefer, you can have a go with a battering ram instead. Players can also choose to use a host of additional rules. The game is ‘encounter’ driven and six exciting, detailed examples are provided in the book to help get players started. The nail-biting turn sequence in the game will require every player to make some tough tactical decisions that may be helped or hindered by the ‘luck of the dice’. The game is designed to be a real leveller and there are no points per figure. To ‘win’ games of Witchfinder General: Days of Revelation, etiquette dictates that players swap sides and play each ‘encounter’ twice. This approach ensures fairness. It also encourages the creation of encounters that are scary and difficult to accomplish. If you are not prepared to take a dose of your own medicine – this game is not for you! So prime your pan - there is evil abroad this night.